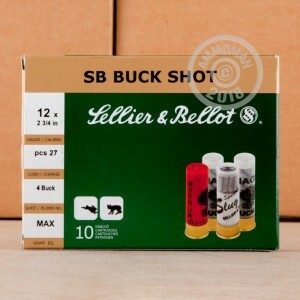 This 12 Gauge shotshell by Sellier & Bellot is loaded with 27 pellets of #4 buckshot. 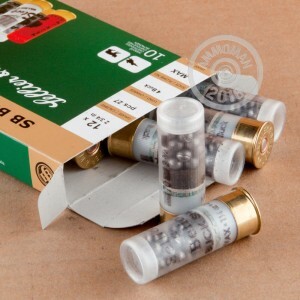 The smallest of the buckshots, the .24” pellets are exceedingly popular for home defense for one primary reason -- while they can very well deter an intruder or threat, they carry a much lower risk of over-penetration that you will want to avoid in your home with other loved ones potentially in other rooms. With a muzzle velocity of 1,185 fps, this shell will give you no issue hunting for game such as coyote and deer -- it’s “buckshot” for a very good reason, after all. Based in the Czech Republic, Sellier & Bellot is one of the oldest companies on earth, and as a member of Companhia Brasileira de Cartuchos S.A. their products are ubiquitous. In their nearly two centuries in business they’ve very rightly mastered their craft, so you can count on this shell’s sensitive primer, clean burning propellant, and attractive clear plastic hull to deliver however you use it. Great stuff for practice or SD.